ONALD REAGAN was known as “The Great Communicator.” I will probably be remembered as “The Lousy Communicator.” For a long time, I’ve tried to explain that we’re unable to respond to all the emails we receive. If I were to adequately reply to each message, I’d have to stop everything else I’m doing and devote hours to email correspondence. Watershed would then cease to exist, because; (1) the monthly internet fees would not get paid; (2) folks would eventually stop donating because the president is not fulfilling his duties. Therefore, the choice is rather simple, as far as I’m concerned. THIS TOPIC IS ACTUALLY RELATED to Sacred music on a local level. 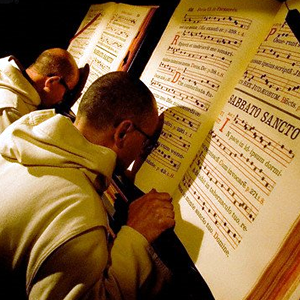 I truly believe that many Catholics, especially priests, desire to have prayerful, dignified, excellent music during their liturgies. This is something they truly want. They’re even willing to pay for it. The problem is, they can’t seem to locate a really good director of music. In other words, it’s impossible for them in spite of their ardent desire. This probably seems like a fairly “harsh” reality. Well, so be it. In many ways, music is difficult. It requires talent, years of careful listening, and (more often than not) expensive training. From time to time, I’ll notice one of my friends giving a workshop on liturgical music, and I secretly cringe when the advertising implies that a few days’ study will allow the participants to go home and successfully implement a musical program. However, I have some good news. We’ve been working hard on something special … for about three (3) years! We’re getting very close to releasing information about this project. I’m not a patient person, and resisting the temptation to “let the cat out of the bag” has been extremely difficult. Please join our mailing list so you’ll be the first to hear about this project. I believe this project will make a tremendous and immediate difference. Granted, this release will only mark the first stage of a large project we have planned. Still, I feel it will make a huge difference and we’re extremely excited!